When looking to help wild or feral cats, it is often recommended that the cats be trapped, neutered, and released (TNR). There are many reasons as to why this is a better solution than removing them from their location. 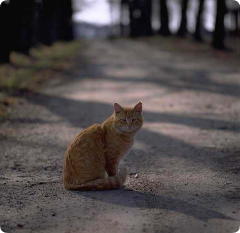 Dr. Meghan Welch of The Beckoning Cat Project wrote a great article from a feral cat's perspective as to why TNR is a humane and workable answer to keeping feral cat populations under control and healthy. Based in Williamsport, The Beckoning Cat Project accepts clients from anywhere and there are no income limitations. They are willing to work with individuals who have overwhelming colonies as well as work with them on the payment. To schedule appointments or for more information, call (570) 971-4592. My name is Frosty. I’m a feral cat, and before you make any assumptions about me, let me tell you my story about how I came to be lounging in this patch of sunlight with a dozen of my closest friends. You might wonder what happened to my left ear. You might be asking yourself what kind of life I have out here. You might even notice that I’m fat and healthy, with clear eyes and a thick, plush coat and wonder if I used to be someone’s pet. I didn’t, and things haven’t always been this good, but thanks to the kindness of local TNR advocates and organizations like the Beckoning Cat Project in Williamsport, life is lookin’ up! “What’s TNR,” you ask? It stands for Trap/Neuter/Return—helpful humans trapping the cats in a colony, taking them to the veterinarian to be spayed or neutered, vaccinated and ear-tipped and then returned to their original outdoor home. It’s a means of controlling feline overpopulation and disease transmission, stabilizing cat colonies and improving the welfare of homeless cats. Yup, you’re right—ear tipping is the reason my left ear has this fashionably flat top. I’ve been lucky enough to go through the TNR program, and that’s how my caretakers and the local authorities can tell I’ve been spayed and vaccinated for rabies. Because it’s so easy to see from a distance, folks know I’ve been taken care of and let me go about my business. Plus if the tuna in the trap smells SO tempting and I get caught again, I’ll just be let out immediately or perhaps get a booster vaccine, rather than an additional trip in for surgery. But I digress—we cats do like a tale—or a tail—that wanders. Let me start at the beginning. A year ago, it wasn’t all mice and catnip around here. My family and friends and I were hungry and cold. I was only nine months old and pregnant, still nursing my first litter of four (yes, we can get pregnant while nursing and can go into heat as young as four months old!) and wondering how I was going to feed my babies and the new ones on the way. The dumpsters were slim pickings; my brother got hit by a car crossing the road to look for food and all the puddles were frozen over, leaving us thirsty and dehydrated. We hid in crevices and open basements, trash cans and dumpsters, trying to get warm—not easy with thin, scruffy coats and no body fat. Sure, we tried to hunt, but all cats aren’t effective hunters and sometimes the prey is healthier and stealthier than we are! Three of my kittens died. And even though we didn’t have enough food to maintain our own body weight, there just seemed to be more and more kittens competing for meager resources, thanks to the local tomcats (who can sire tens of litters a year, in a one- to two-mile radius). And those guys, well, they weren’t anyone you’d bring home to mama—fighting all the time, yowling, covered with bites and scratches. Then things started to change. A couple of folks came around, really polite folks. They just sat and watched us for a while—didn’t chase us or scare us or try to do anything. They poked around the corners of our area behind this building, checked out the bushes and then they left. Next time they came back, they put out these metal boxes—traps. Boy, did they smell good! I love tuna. We don’t get that around here. I went into the trap to sniff and snap! It closed. Sure, I was startled and didn’t know what to do, but I didn’t have to wait long. My caretaker covered the trap with something soft and when I next saw the light, I was in a warm building. I felt a little prick in the muscle of my thigh and next thing I knew, I woke up in a warm, dark carrier. I felt a little woozy—turns out it was the pain medication after my surgery. I had a small incision on my belly and my ear felt funny, but I didn’t hurt. The drugs had a calming effect and I didn’t object when the carrier was moved to a warm, protected place overnight. I nibbled at the fresh food and drank my fill of clean, clear water. The next day, I was back at my home, back among my family. But oh, how it had changed! Many of my friends and family were being released from carriers just like mine. Others were in traps, being loaded into cars to take the trip I had just taken. Several shelters had popped up in my absence—sturdy wooden boxes with doors just the right size for cats, filled with straw for snuggling down and maintaining body warmth. There were water bowls of clean water, heated in the winter, plus big dishes of kibble. Even paper plates of canned food! Don’t get me wrong; we feral cats do the best we can with what we’ve got. It makes a big difference to our health and quality of life when there’s someone to feed and water us, provide shelter and monitor our health. Being feral, we really don’t trust easily, so we can’t be picked up and held and we don’t do well in cages in adoption facilities and our lack of socialization means we don’t make good pets. It’s just too much after a lifetime of fear. That said, we sure appreciate being provided with food and shelter. Those motivate us, and when provided by a TNR program, we are likely to stay close to our food source and avoid roads and unsafe environments, as well as other people’s private property. Other advantages? Well, spaying and neutering results in fewer kittens for sure! That’s a decrease in the homeless cat population over time as more people get involved with TNR in our community. The neutered males turn from ruffians to gentlemen—very little fighting, fewer wounds, and less spread of disease secondary to breeding behavior (the number one way disease is spread among feral cats), and they stick closer to a colony rather than roaming the county in search of bar fights and floozies! I can tell you that I’m a lot healthier, not being pregnant and nursing all the time; in fact there’s less disease in the colony in general because our immune systems are stronger with fewer hormones and more food. TNR results in what’s called colony stabilization. That means that ferals like me are very attached to our home of origin and tend to stay in a defined area where food and shelter is provided. When no new kittens are born, the population, like a nuclear family, tends to remain static. New cats are only added if they’re dumped (and those don’t always stay, given the existing dynamic) or migrate in. This happens less often than you might think—we’re a pretty tight group. So over time, a stable colony grows smaller by attrition—natural death from age and disease. Because we’ve got such good caretakers, when one of us gets very ill or injured they get another trip to the veterinarian. Sometimes they’re too sick to come home, but we all know that they were taken care of gently and humanely in their final hours. What about finding homes for us? I know that’s what you’re thinking because I’ve heard it over and over. Remember that our innate fear and lack of human socialization means that confinement can cause stress and illness in us ferals. Thankfully, our kittens under eight weeks old can be socialized and adopted out. That’s a way to save a life! When circumstances dictate that we can’t stay in our outdoor home, we can be humanely moved to a barn or other rural environment, where we still have our freedom, food and shelter. The mighty hunters among us can be great rodent killers and even the smell of a predator species will keep many small prey away from your property. It’s true that feral sanctuaries sound like a great solution. Though a well-run sanctuary can be Nirvana for the likes of us, it takes a great deal of knowledge, manpower, funding, and time plus the proper facilities to assure our well-being and prevent suffering and illness due to overcrowding or substandard care. You want to just remove us all? Really? That may sound like a quick and easy solution, but there’s something you should know. Once our population is stable, like I said before, it will slowly shrink as the years go by while maintain its integrity. If you take us all away, you create a vacuum—an empty space where there used to be cats. There were cats there for a reason. It was a place where we could get by. And over time, cats will come again—unneutered cats, unvaccinated and they’ll be bringing their kittens and their kittens’ kittens because there’s no colony there to tell them to move along and no caretakers to control their breeding and monitor their health. Even if you only remove some of the colony, “cutting back” without TNR will only mean that more kittens will survive because fewer cats are competing for resources and the population will grow all that much faster. The bottom line here? TNR helped me and my family, and it can help you too. The reason I’m here today, basking in the sunshine on top of my shelter instead of scavenging for food, is because the people in this community were willing to work together to give me a good, humane quality of life, and in return they’ve got a quiet colony of cats who clean up the bugs and rodents, keep the peace in the neighborhood and coexist happily with our neighbors. TNR organizations like the Beckoning Cat Project have the resources to do what’s needed to help cats like me—affordability, vets who are trained in pediatric spay/neuter (an accepted practice for over 25 years; means kittens as young as 6-8 weeks can be spayed/neutered with no adverse effects), rabies prevention and documentation, ear tipping, and educational assistance to help caretakers set up their own managed colony. Got feral cats? Contact a TNR organization today. You’ll be glad you did. I know I am…purrrrrrrrrrrrrr.